Photo Booths and ONLY Photo Booths! Of course, it is much easier to go to a one stop shop that you can get your DJ, Photo Booth, photographer, and Videographer from. However, there is a good chance that you are going to be dissatisfied at the end of Your Big Day due to the lack of focus in one area. We put ALL of our focus on making sure that your photo booth experience is nothing less than excellent. We strongly encourage you stay away from companies that offer you EVERYTHING. We are very happy to provide you with a great list of vendors that we have worked with many times and offer excellent quality and customer service. Congratulations & Happy Planning from everyone on the Qwik Picz Team! At Qwik Picz Photo Booth, our mission is to provide our clients with an incomparable experience at affordable prices and be the rental company of choice in the markets we service. We are fully committed to our clients and incorporating the most advanced technology in our state-of-the-art photo booths. In our pursuit of excellence, we provide high value photobooth rental through our relationships with our clients, suppliers, and business partners. - Builds and maintains a customer-orientated culture. - Promotes and nurtures service excellence. - Acknowledges that the service excellence concept must be a key part of the very structure and operation of the organization. 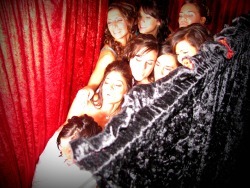 - We are widely recognized as the premier provider of photo booth rental services across the country. - Establishes us as one of the top photo booth rental companies on a national level by the means of recognition well within and outside the company with constant technical and social development by higher education and greater exposure. - Strives to offer services that meet our customer’s, as well as their guests, needs and are of excellent quality and value.